Ian James has had some racing adventures this year in a variety of cars, classes and series / races. From a Crawford at the start of the season, at Daytona, to a PTG BMW at Sebring, through Grand Am drives in DPs and Porsches, a regular Grand Am Cup drive, the Miracle Courage at Le Mans – and now back to PTG for Petit Le Mans. 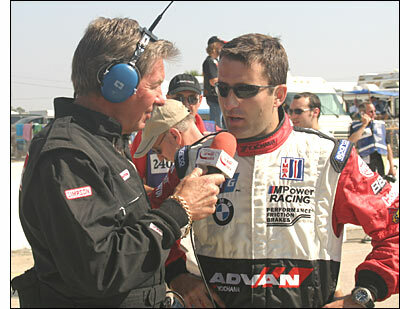 “That was always the plan and I was contracted for Sebring and Petit, when I could not commit to the whole series back at the beginning of ‘06,” says the ex-pat Englishman, pictured with Bill Adam at Sebring in March. "I’m looking forward to being back at PTG BMW, especially as the car has made great strides in recent races and is a genuine contender again. The team will do a further three days of testing with Yokohama before the event and I am optimistic of a good result in what is a great GT2 field." He’ll be partnering Bryan Sellers and Justin Marks in the #22 BMW. He raced the #21 car at Sebring. The Petit Le Mans entry list should be available soon.